In September of 2016, a newspaper headline cried out: Make or Break Time for Belfast’s FM radio station. Time was short, as the 2-year FCC application period was set to expire in January of 2017. The City had procured a basement studio at Waterfall Arts (formerly the Anderson Elementary School). 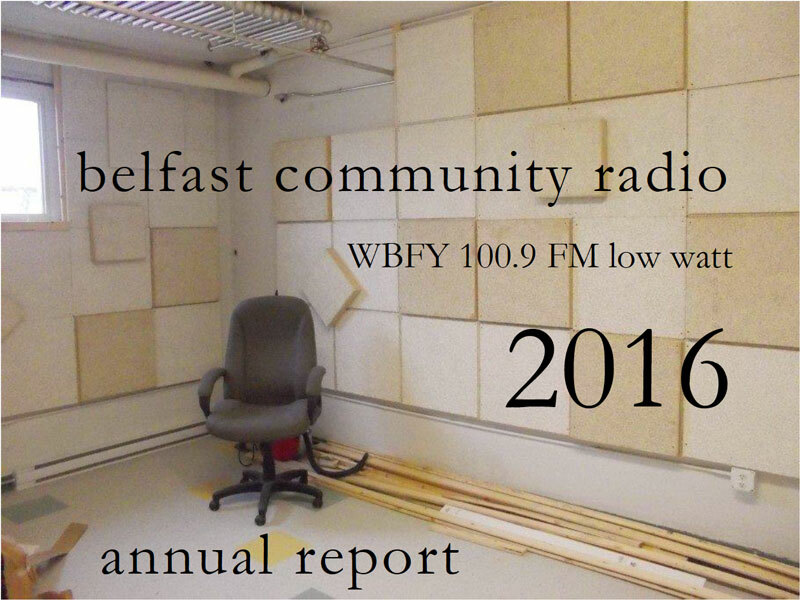 Skeptics watched as the process that had began in Belfast City Hall three years earlier culminated by December in the founding of Belfast Community Radio. Many thanks to the City of Belfast staff Manda Cushman, Joe Slocum, Nora McGrath, Theresa Butler and counselor Neal Harkness for their vision and dedication in making the station a reality. We dedicate this first annual report to them, to the volunteers, and to those who donated money and equipment to this exciting new venture. Fundraising was the most active committee early on. Volunteers scheduled three events for the “Launch Phase” of the campaign. The first, a fundraiser/potluck supper/live dance jam, was on short notice. It was a busy night for Belfast and not that many people came out. But, when Casey Dowdell walked in that night, full of enthusiasm for ultra local radio, he became the station’s angel by making a significant cash donation. 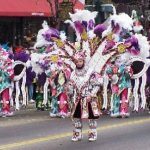 When he showed up at the next Fundraising Committee meeting offering equipment and soundproofing tiles, it made everything seem possible. It’s difficult to assess the importance of someone walking through the door with that kind of belief in a cause. Vic’s idea for a Spooky Halloween Radio Show was the second event, which turned out to be a big hit with the Cedar Street trick-or-treaters and their companions. 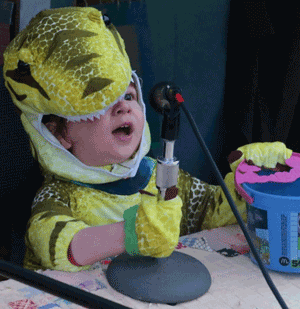 Kids of all ages got to play disc jockey in a tent set up with real microphones and recording capability. Vic, Wylie Fowler, Jay Rosenberg, and Steve Chiasson provided tech for the event. Patrick, Petra, Jennifer, Erik, and Marshall volunteered out front. Tony Chiodo took photographs. The last event scheduled was another fundraiser. This time, Colonial Theatre showed “Radio Days.” By then, the word was out and folks stopped by to make a donation even if they couldn’t stay for the movie. Judi, Jennifer, Patrick, Erik and Vic were on hand to greet viewers, make speeches, and tend the raffle. September 19, Belfast City Hall was filled with excited people. 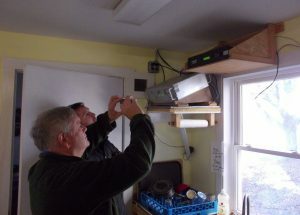 Later that night, a couple of guys who would go on to become major players in getting the station up and running, Erik Klausmeyer and Vic Tredwell, set up a meeting to begin fundraising. Vic’s cousin Geoff Gilchrist allowed the group to use his place as a kind of headquarters, a structure originally built to be a church (stained glass and all). The group that met became the Fundraising Committee. Erik and Vic were joined by Karen Nelson, Patrick Walsh, Petra Hall, Zafra Whitcomb, Bryant Richardson, Pete Dalton, and Jennifer Hill. By mid-November, the All-Volunteer meeting by then held in the conference room of the Belfast Creative Coalition was packed with enthusiastic volunteers. “Tabling” at the Belfast Co-op Store (sitting in front of the store at a table with a large jar for contributions) was a last minute affair, but the enthusiasm and cash generated made it worthwhile. New resident of Belfast, Caryn Converse signed up to lead off the day with a few hours of her time and others on the committee who were available joined her, including Zafra, Patrick, Jennifer, Vic, and Petra. A postcard seeking donations of $20 was the first tool they used. Erik, a veteran of radio fundraising campaigns, designed the following underwriting levels and committee members took to the streets and email in search of donations. By November 1, the Tech Committee was in full swing. A work party gathered in early November to soundproof the studio with Casey’s donated tiles. Derek, Marshall, Vic, and Jennifer drilled, pounded, screwed and designed as they went. 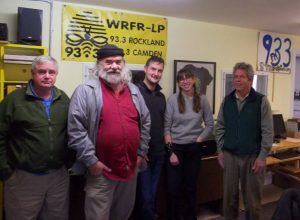 On November 11, Peter, Vic, Erik and Jennifer headed for Rockland and WRFR-LP, 93.3 FM to meet with founder Joe Steinberger and manager Jo Lindsay. They couldn’t have been more welcoming; both stations shared their desire to work together in the future. Official Launch Day from the basement of Waterfall Arts was December 17 and partiers came out in numbers for the event despite the weather. Organized by Vic and Judi Erickson, local musicians played on the new station and before the crowd assembled at the Waterfall Arts Fallout Shelter. The station’s logo was unveiled shortly after the launch day festivities. Patrick had been circulating sketches that students at the Waldo County Technical Center had come up with for the station. The winning design is by Connor Dodge.